Arlene: I want to have a baby. Arlene: We love each other. It'll be a love child. John: Well, my mom leaves town in a couple weeks. Then we can get married, and we can talk about having a baby, okay? Arlene: I don't care about a wedding or anything. John: You can have whatever you want. Arlene: [breathlessly] I want lots of babies. I saw this film in Winnipeg recently - appropriate, given the location used. I first read Lawrence's book back in the 70's and for me, it's always been a very powerful picture of the trials of aging in our society. It resonated when I was young, and it resonates even more now. When the film came out, I was keen to see if the story could survive. 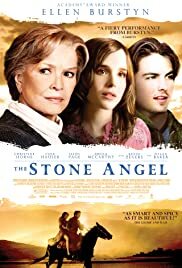 and was thoroughly impressed, especially with Ellen Burstyn's performance. She manages to give us a complete human being, even though the character is generally cranky and judgmental - someone that you wouldn't want to live with. It's great to be able to see favourite characters come to life so authentically.